Dr Najeeb’s Video on Neuroanatomy – These are super amazing videos on Neurology. If you are still in the medical school or beginning of your preparation for Step 1 then make sure you watch them. They are pretty lengthy but he explains everything really well. High Yield Neuroanatomy – I love this book. This book pretty much saved my life on Neuroanatomy. Easy to read and a must have for step 1. I pretty much read this book front to back. Even after reading First Aid, if I did not understand anything I would come back and look into this book. You really want to have this book! It will take you only 2-3 days to read. You can even read it before going to bed. First Aid – Make sure you read First Aid after you are done with Dr Najeeb and High Yield Neuroanatomy, it will make much better sense then. Read every single section carefully and memorize whatever you need to memorize. 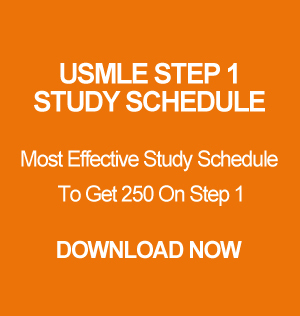 USMLE World – After you have gone through Dr Najeeb, High Yield Neuroanatomy and First Aid, now you are ready for UW. Go over each question carefully and write down all your notes on FA. Now you will get so many imaging and labeling questions. Some of them you will get wrong and some you will get right. Either way I recommend you guys to take pictures of the CT, MRI and XRAYS with your cell phone. This way whenever you are free you can go over them. The images from the UW are almost the same images that they use on the actual exam. So they are pretty high yield. Kaplan Lecture notes and other sources – I did not use kaplan for neuroanatomy. I hated kaplan’s neuroanatomy section. It is overfilled with information and kind of demotivates you when you look at the information. So just stick to Dr Najeeb, HY Neuroanatomy, FA and UW. Forget Kaplan! That’s about it folks. Neuroanatomy is all about images, labels and concepts. Most of the diseases are easy to remember but when it comes to images and basics it can be tough. But if you listen to what I said you will be fine. So in short summary, take pictures of all the Neuro images from the UW and go over the High yield Neuroanatomy and you should be good to go. Good luck!